The Roomba from iRobot is the most trusted and popular robotic vacuum cleaner brand in the market today. So much so that ‘Roomba’ is well on its way to becoming a generic name for robotic vacuum cleaners. The iRobot Roomba enjoys all this fame and glory thanks to their clever design and simple operation. Over the years, iRobot has successfully launched a long list of Roomba models and continuously introduced newer technologies to make their cleaning machines more efficient. The iRobot Roomba 620 vacuum is the company’s entry-level offering, but still packs in a punch in terms of features, practicality, and usability. The 620 is armed with some clever technologies such as the iAdapt and AeroVac which makes it a much more intelligent cleaning gadget than its predecessors. Apart from these, the Roomba 620 has a long list of features up its robot sleeves and we will show them all in the following sections. We went ahead and took the iRobot Roomba 620 through its paces and here’s our impression. Efficient Cleaner: When it comes to sheer cleaning power, the Roomba 620 does not fall short. It has a special 3-stage cleaning system that effectively cleans dirt, pet fur, and debris almost effortlessly. This model also comes with an improved brush design that ensures a thorough clean in fewer passes over the same area. ​Versatile: This is a very important factor when buying a robotic vacuum cleaner, because most customers prefer a model that’s suited for all kinds of surfaces and can tackle almost any cleaning challenge. It works well on hardwood, linoleum, tiles, and other hard surfaces, but it also cleans carpeted areas with ease. Its many sensors and clever cleaning algorithm also allow it to clean tight spots such as corners and edges of walls. Elegant Looks: Design was one thing that robot vacuums were struggling with compared to their competition. However, the iRobot Roomba 620 successfully overcame that problem. When it was launched in 2012, the Roomba 620 featured a revamped look. The dual tone colors and clean lines give the machine a very advanced, yet subtle look that’s more appealing than previous models. ​Decent battery Life: Getting a robot vacuum cleaner with a good battery life is crucial as there are plenty of models that run out juice within 40 to 50 minutes. This significantly increases the cleaning time and tests your patience as it hums around for a longer time. Even though iRobot has not mentioned the exact power of the battery unit, we found the overall battery life of the Roomba 620 to be pretty satisfactory. On a full charge, the Roomba can deliver a nonstop cleaning time of about 80 minutes, which is more than enough to clean most rooms. Bumps into Objects and Walls: This is a typical Roomba problem that seems to have been passed on to the 620. While there are plenty of other robotic cleaners out there that gently touch and maneuver past objects and furniture, the Roomba 620 takes a much cruder approach. It often bumps into walls and furniture to understand the layout of the room it’s cleaning. Even though these bumps are not hard enough to damage anything, it does make the cleaning operation look unsophisticated and a little noisier. No Scheduler: This we think is a major drawback and can be a potential deal-breaker for a lot of customers. Without any on-board scheduler, you have to turn on the machine manually every single time. This means you cannot schedule the machine to clean the house when you are out of the house. 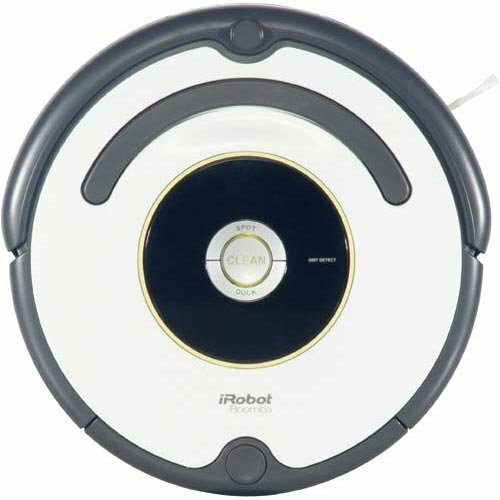 iRobot Roomba 620 vacuum is a 33 – watt machine and weighs about 11 pounds. As mentioned earlier, the Roomba 620 has a lot of features that makes it an efficient cleaning machine. Following are some of the key features of the iRobot Roomba 620 vacuum. iAdapt Responsive Cleaning Technology: First that needs to be mentioned is the iAdapt cleaning technology, which uses multiple sensors and scanning technology to maneuver around and make sure it provides a thorough clean. Powered by iAdapt, the iRobot Roomba 620 vacuum can efficiently clean wall edges and keep itself from getting tangled in wires. The iAdapt technology also allows the bot to scan and understand the environment better future cleaning. For example, it automatically detects sudden drops such as stairs and has the ability to push past soft obstacles such as curtains and bed skirts. iAdapt also gives the Roomba dirt detection capabilities as it can intelligently seek out dirtiest areas and cleans them first. AeroVac: This is a technology that automatically pulls in hair and other debris off the brushes, keeping the brushes themselves clean. This is a clever little innovation that eliminates the need for cleaning the brushes while maintaining an efficient cleaning performance. Compatible With Virtual Wall: This particular Roomba is compatible with iRobot’s Virtual Wall accessory. Using the Virtual wall box you can create an invisible border to either keep the robot inside a room or prevent it from going into another area. If you’re looking for a simple machine that has great performance and is easy to use, then the iRobot Roomba 620 vacuum is definitely worth considering. However, the lack of scheduling feature is a genuine drawback, which can be a big compromise for a lot of people. If you can overlook that and judge the Roomba by sheer cleaning performance, then buying the machine definitely seems to make sense. Irobotroombareviews.com is a participant in the Amazon Services LLC Associates Program, an affiliate advertising program designed to provide a means for sites to earn advertising fees by advertising and linking to Amazon.com. Amazon and the Amazon logo are trademarks of Amazon.com, Inc. or its affiliates.